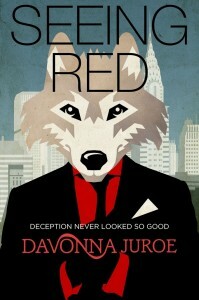 Super excited to finally be able to unveil my next project Seeing Red today. The very talented indie designer Scarlett Rugers created this lovely gem of a cover. Audrey Hepburn’s iconic Breakfast at Tiffany’s gown sets the standard for the decade’s little black dress, Marilyn Monroe’s sultry rendition of “Happy Birthday” to President John F. Kennedy heats up the New York stage, and James Bond makes his first big on-screen appearance. It is a time of glamour, where martinis flow freely and socialites puff cigarettes as a symbol of class. The petticoat is on its way out and the pillbox hat is in while the birth control pill penetrates American bedrooms. In the midst of sweeping change, one convention remains. The American Dream: A fairytale based on a white picket fence and a woman’s commitment to being a perfect housewife. Bridget Jeane, a 22-year-old New Yorker, is about to say “I do” to this idyllic domestic future. Until the night she’s almost killed in a car accident. Waking up in a hospital room, Bridget recalls a fight and her drunken fiancé losing control of the car. In the aftermath, Bridget abandons her matrimonial future. She says goodbye to the Midtown lights and swanky nightclubs of the Big Apple. On the eve of her move, Mr. Frank Connery, a successful Madison Avenue advertising executive, asks Bridget for a date and won’t take no for an answer. Mr. Connery shakes and stirs Bridget through a cocktailed dreamscape of Manhattan’s glitzy nightlife. But there’s a twist in the evening’s drink that she doesn’t see coming. Inspired by the popular AMC television series Mad Men and garnished with themes from Ira Levin’s novel Stepford Wives (which was twice adapted to film), Seeing Red is an historical, coming-of-age novella that examines traditional values and gender roles during a rapidly changing era. Seeing Red releases December 23rd, 2013 on Amazon.